Brett Kavanaugh, President Trump’s nominee to replace Justice Anthony Kennedy on the Supreme Court, would be a disaster for the separation of state and church. Here are 10 reasons why. FFRF has been told that senators are paying attention to the ratio of calls for and against Kavanaugh. SO CALL AND EMAIL YOUR SENATORS TODAY. Take action. At the end of this brief but damning list, you will find a link that will promptly and efficiently help you. 2. In an amicus brief to the Supreme Court for the landmark case Santa Fe Independent School District v. Doe in 2000, Kavanaugh argued that the Supreme Court should allow the machinery of the state, our public schools, to be used to proselytize students. Kavanaugh argued that the school had to provide religious students with a government megaphone that they could use to impose prayer on other students. Given his reverence of “history and tradition,” which he mentions constantly in the brief, Kavanaugh would allow a shrinking religious majority to impose prayers on the 21 percent of younger Americans who are either atheist or agnostic, as well as upon religious minorities. 5. Kavanaugh has used “history and tradition” to argue that there should be no real separation between state and church. He’s done so throughout his career, from an early private practice brief arguing for prayer at public school events up through his speech accepting the Supreme Court nomination, when he said he would “interpret the Constitution as written, informed by history and tradition and precedent.” To uphold government endorsements of religion (i.e., violations of the First Amendment), Kavanaugh reaches for history. And often, he gets his history wrong. For instance, in a challenge to presidents adding “so help me God” to the constitutionally prescribed secular oath, Kavanaugh argued that the oath should be altered because George Washington initiated it. Only he didn’t. More importantly, an overreliance on history and tradition in the law retards progress and, at the Supreme Court level, can even turn back the clock. Where would our nation be if constitutional violations were legitimized by a long history? Slavery, segregation and the legal subjugation of women would plague us still. Kavanaugh would apply this in particular to issues involving state and church. He would allow religious oaths, prayer at government ceremonies, prayer over the loudspeakers at public school events, and presumably many other state-church entanglements in the name of history and tradition, such as Ten Commandments displays and crosses on government property. 6. Kavanaugh fought to uphold vouchers for private religious schools in Florida. As governor, Jeb Bush instituted a private voucher program that would have sent public money into the coffers of church schools. The Florida Supreme Court struck down the unconstitutional program. 7. He would help the Religious Right destroy our public schools. In a 2017 speech, Kavanaugh argued that “religious schools and religious institutions” ought to “receive funding or benefits from the state,” as long as the funding goes to private institutions that are both “religious and nonreligious.” But the vast majority of private schools are religious, so even if funding is available to religious and nonreligious private schools, nearly all ends up supporting religious schools. For instance, 99 percent of the schools participating in the Indiana school voucher program are religious schools. 8. Kavanaugh would eviscerate the vital No Aid protections in state constitutions, which bar the flow of public money to churches and church schools, thereby sending millions of taxpayer dollars to churches and religious organizations. As Rob Boston at Americans United pointed out, Kavanaugh’s stance on vouchers and publicly funded religious schools, “if extrapolated, could wipe out the no-aid-to-religion amendments that curb taxpayer support to religion in 38 state constitutions.” Some on the Right are very excited about this possibility. 9. Kavanaugh defends religious privilege while trampling the rights of women. Last year, he argued unsuccessfully that the government could force a 17-year-old girl detained as an illegal immigrant to continue her unwanted pregnancy — with conditions that essentially would have forced her to carry the pregnancy to term. But to Kavanaugh, that was not an “undue burden” on her rights. At the same time, Kavanaugh has stated that filling out a simple form is a burden on a Catholic religious organization. In 2015, Priests for Life challenged the opt-out procedure for the Affordable Care Act’s contraceptive mandate. 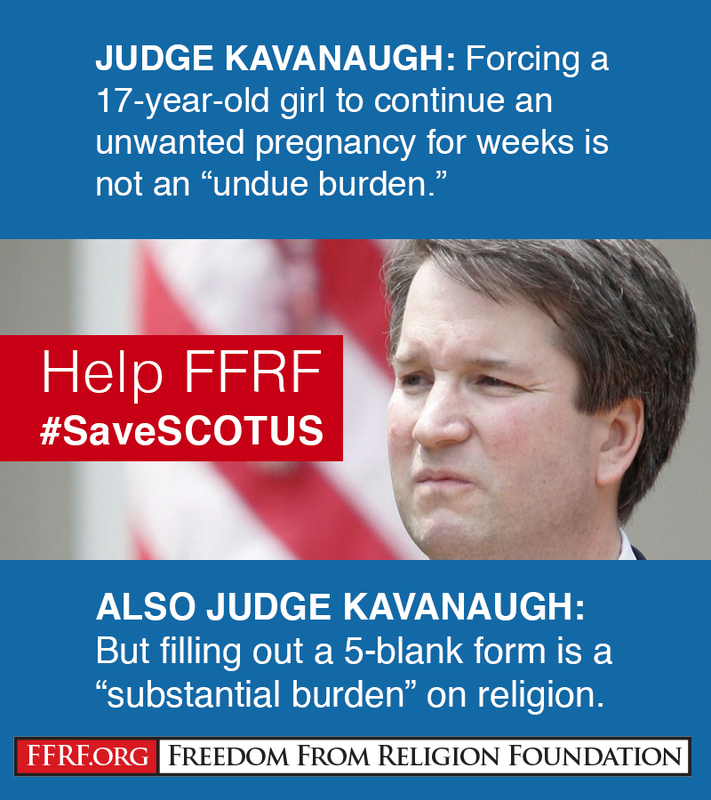 Kavanaugh wrote that it is a “substantial burden” on religion merely to ask a religious organization wanting an opt out of the contraceptive mandate to fill out five blanks on a form — name, corporation name, date, address and signature. Kavanaugh has a double standard on burdens that could be deadly for women. 10. Kavanaugh would weaponize religious freedom. This critical individual right is being redefined by judges like Kavanaugh, who think it grants Christians a license to discriminate and allows them to use the government to impose their religion on others. This was most obvious in his decision in the Priests for Life (mentioned above.) Kavanaugh would also allow religious employers to deny women contraception in spite of the Affordable Care Act’s contraception mandate, because of a two-page form. The female employee’s freedom is what’s really threatened, but Kavanaugh twisted the case in defense of the “religious freedom” of the employer instead.